The courtship effort of any male depends on his age, his display rate and his courtship persistence. Uca annulipes has a body size correlated with his age and waves at females more and more persistently with age. He is of course a fiddler crab. This research was aimed at finding if age affected breeding success from the male-display point of view. Obviously female preferences and fecundity also come into it. Reproductive effort doesn't need to increase with age. In one arthropod, the cricket, Teleogryllus commodus, "called" more when young, when it had a high quality diet, and died younger than those on a low quality diet. The level of courtship behaviour generally in animals can increase, decrease or stay the same with age. Deep in the mangrove swamps of Chukwani on the island of Zanzibar, the fiddler species was studied from a distance of 2m by stationary researchers who tried to ensure the animals were not disturbed. The unfortunate females were captured for use as lures for the males. At 10cm from the males' burrows the ladies were able to produce a minimum of 5 waves in 5 minutes from the potential mates! In this way the size and the age of the male could be rated as affecting waving or not. To see if the display varied with age, the same males who had been observed to wave were checked again to see how many waves they made and how long they persisted. In both of these sets of experiments, several external factors could have influenced the males without being measured within the experiment. However, the results seem to justify disregarding any such possible side-effects. What happened in the results provided evidence that old males started waving more often, with female size failing to influence them in any way. The display from these old chaps was also more persistent, and with more waves produced. The rate of waving was NOT affected by age, however. Difficult as this is to understand, the old male is liable to wave more often and for longer periods, but he waves at the same rate per minute whatever age or size he is. Circumstances influencing these crabs are likely to be lower mortality rates among older, larger males. Seabirds that are their main predators have a beak-gape limit. Also the older male is able to mate with larger females who have more eggs, as the ladies can get into their burrows in order to complete the operation. The girls also prefer males with larger claws. Young guys can wave so much that the energy available for their growth is reduced, while large guys will have more energy and are more likely, "to get the girl," in many cases. Also, large males might have bigger eyes to see their mate or, alternatively, they could stimulate other males to compete! Now it's time to watch the neighbours. By that, we refer to other species, which could have totally different strategy. The aggressive sounding Uca pugilator has larger males that wave more and feed less. So reproductive effort can vary in the genus, but the result will be similar. The older you get, the worse (better) you get! The full research paper, Does male reproductive effort increase with age? 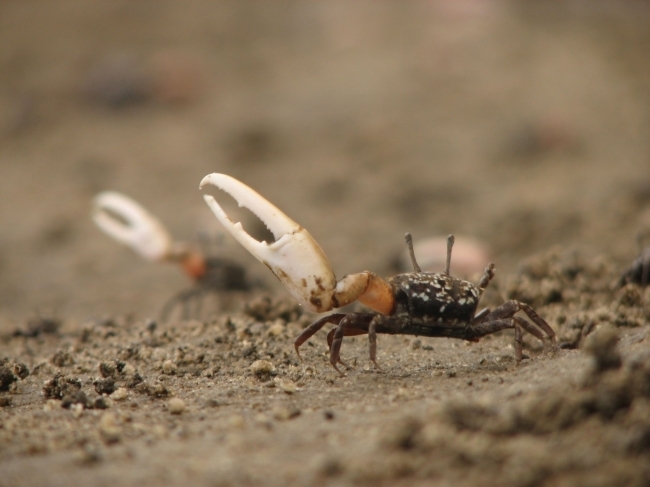 Courtship in fiddler crabs, has been published in Biology Letters.